During the 1860s, a United States diplomat named E.G. Squier traveled to Cuzco, Peru. While visiting the home of a wealthy woman who collected antiquities, he was shown an ancient skull. Discovered in an ancient Inca cemetery in the Valley of Yuca, the skull dated to pre-Columbian times and had a large, rectangle-shaped hole near its top front. Squier—a well-educated polymath whose areas of expertise also included archaeology and Latin American culture—was immediately intrigued. So in 1865, Squier brought the skull to New York, where he presented it to members of the New York Academy of Medicine. Squier believed that the skull was clear evidence that Peru’s ancient people had performed prehistoric brain surgery. The hole’s cross-hatched outlines were the work of a human hand; Squier noted that they were most likely made with a burin, a tool used by engravers on wood and metal. Even more shockingly, he observed, the skull showed signs of healing—meaning the patient had survived the procedure for at least one to two weeks before they died. Members of the medical community were skeptical, and didn't believe that the cuts were made prior to death. So Squier sought the opinion of renowned French surgeon and anthropologist Paul Broca. In turn, Broca looked at the skull, and concluded that early indigenous societies had been performing “advanced surgery” long before Europeans arrived. The practice of drilling or scraping a hole into the skull’s cranial vault to expose the brain’s dura mater and treat brain injuries is called trepanation. First mentioned by the Hippocratic corpus, it’s one of the world’s oldest surgeries. (In fact, the word trepanation comes from Greek, and means “auger” or “borer.”) Today, the medical community would refer to it as a craniotomy. Throughout history, trepanation has been practiced in nearly every part of the world. It was performed in ancient Greece and Rome, and is today even reportedly used in parts of Africa, South America, and the South Pacific. In ancient Greece, it was used to relieve pressure, remove skull fragments from the brain after a traumatic accident, and for drainage. From the Renaissance until the beginning of the 19th century, trepanation was routinely used to treat head wounds, and into the 18th century, it was used to treat epilepsy and mental disorders. The Victorian physicians of Squier and Broca's time had never considered that “primitive” cultures throughout history may have attempted the procedure. Also, since survival rates from the surgery were so poor due to hospital-acquired infections, they doubted that ancient patients could have lived for long following the operation. After Broca acknowledged Squier’s find, scientists began discovering trepanned skulls across the globe, dating back to the Neolithic period. Hole-filled heads were discovered in Western Europe, South America, and the Americas. Over the years, it became clear that trepanation was attempted by many societies across the globe, starting in the late Paleolithic period. Techniques varied from culture to culture. Prehistoric trepanations performed in early Peru were done with a ceremonial knife called a tumi, which was used to scrape or cut through the bone. 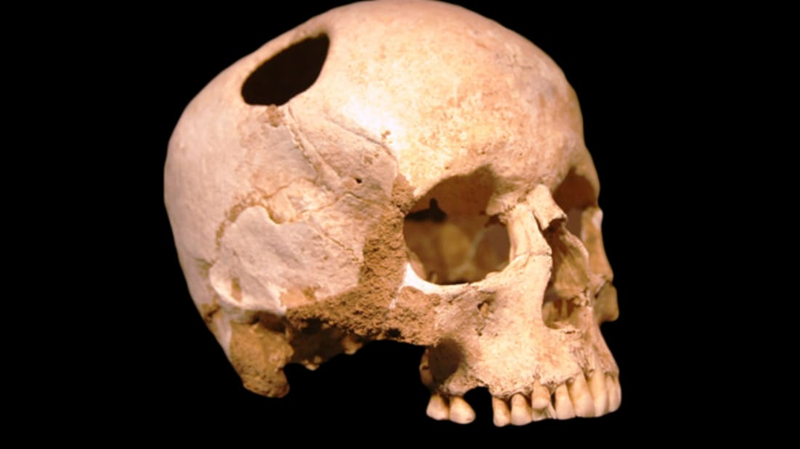 The Hippocratic school invented the trephine drill, which bored holes into the skull. In the South Pacific, they sometimes used sharpened seashells; in Europe, flint and obsidian. By the Renaissance period, trepanation was routinely performed, and a range of instruments had been developed. However, due to the high infection rate, the practice soon waned. Trepanation was performed on young and old, male and female. In many instances, the prehistoric patients had lived for years after the surgery. According to writings by Charles Gross, a professor of neuroscience at Princeton University, estimates for survival range from 50 to 90 percent. However, in many cases, the surgeon's motive for performing trepanation remains unclear. In some instances, trepanned skulls show clear evidence of trauma—meaning there must have been an underlying reason why the procedure was performed. However, archaeologists have also uncovered trepanned skulls that don’t show depressed fractures. Squier's famous skull, for instance, didn't indicate any signs of a head wound. Skulls with multiple holes have also been unearthed, revealing that patients sometimes had—and survived—more than one surgery. According to Verano, modern eyewitness accounts from Africa and the South Pacific state that trepanation is still used to treat head wounds, headaches, or pressure on the brain. In other parts of the world, it’s thought that trepanation might have once been used to release evil spirits, or to treat insanity or epilepsy. But without any written record, we’ll never quite know why these kinds of surgeries were performed in the absence of obvious injury. Individuals who underwent trepanation weren't administered anesthesia. Did the procedure hurt? In today’s modern Western hospital, trepanation is no longer viewed as its own curative procedure. It’s used to debride a wound (remove dead or infected tissue), relieve pressure in the skull, or perform exploratory surgery. However, it’s fascinating to realize that the surgery survived many millennia—and that as early as prehistoric times, humans were already connecting the brain’s functioning to the body. We can only wonder what people of the future will think of our own modern brain surgeries.